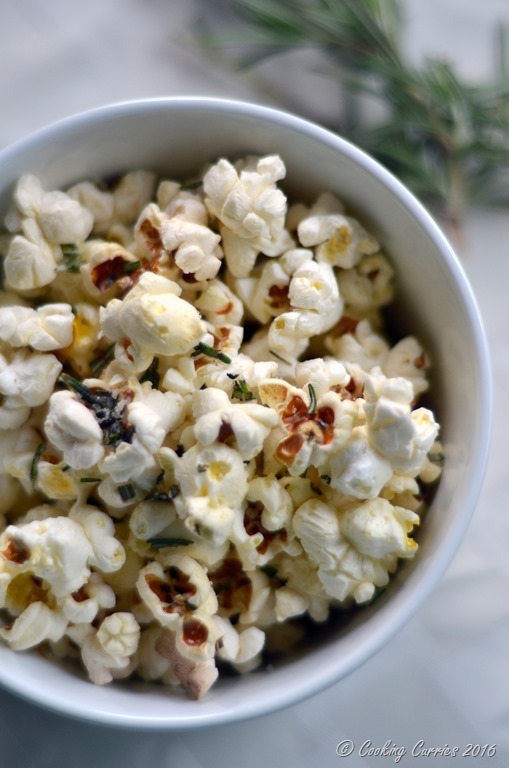 Homemade popcorn made with organic corn and seasoned with truffle oil and rosemary to make this simple treat a little bit exotic! It is Gluten Free and Vegan! Want a simple and easy snack to make really quickly? Popcorn it is, then! And no, not the nasty microwaveable popcorn, in which, who knows what all horrible things are there. I buy Organic Popping Corn from Trader Joes or the Bobs Red Mills Organic Corn and a regular one pound or so bag will take you through at least 7-8 movie nights for a family of three. A 1/2 cup of popping corn usually yields about 15-16 cups of popped corn. The best part about this is you can decide the flavor you want, depending on what you are in the mood for. 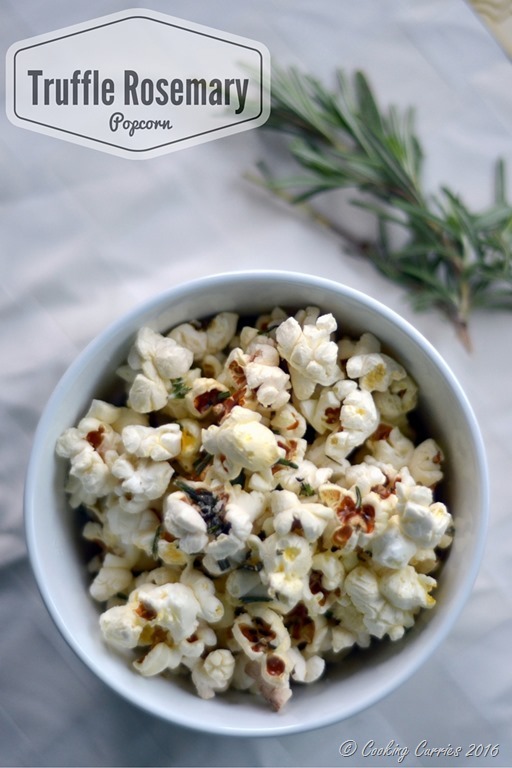 We have made this Truffle Rosemary Popcorn, Salt and Pepper Popcorn, Parmesan Popcorn and just Butter Popcorn. They all taste so good and you know what you are eating and feeding your family especially the little ones and everyone is happy. So, what are you waiting for? Go get that bag of popping corn and go make your self some delicious popcorn! There are several options out there and here are some of my favorite organic popping corns! Heat the oil, over medium heat, in a heavy bottomed pan with a lid. Add 2-3 corn kernels in it. Once they pop, add the remaining corn kernels and close the pan. Shake the pan as often as you can, keeping the lid intact, till the popping sound stops. Switch off heat. Add the salt, truffle oil and rosemary and toss well. Popcorn is my absolute favorite snack. And I’m w/ you, not that nasty microwave stuff. If my husband works late, I sometimes will make a bowl of popcorn and a glass of wine my dinner after the kids are in bed, as a treat. I would love to try it this way. I’ve never used these flavors w/ my popcorn before. Popcorn is one guilt free treat!! And yes to that glass of wine ? Yum, savory popcorn, tasty tasty. 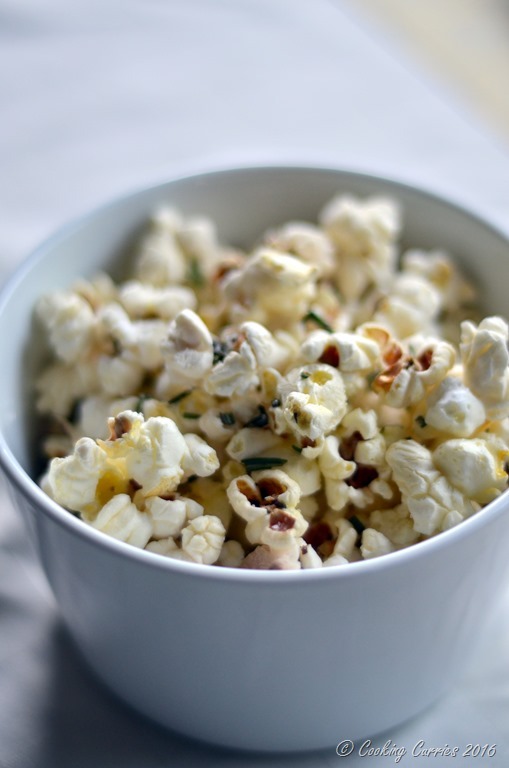 I love the combination of popcorn with truffle oil and rosemary. I have made this same popcorn before, but I did not use truffle oil. I am going to have to try this! I hear truffle oil is amazing in flavor. Yes, amazing in flavor and fragrance!!! We have movie night this Wednesday and I am going to make this popcorn. I really don’t care what movie we will be watching because I will be busy eating these delicious popcorn! I love popcorn, what a delicious sounding preparation!